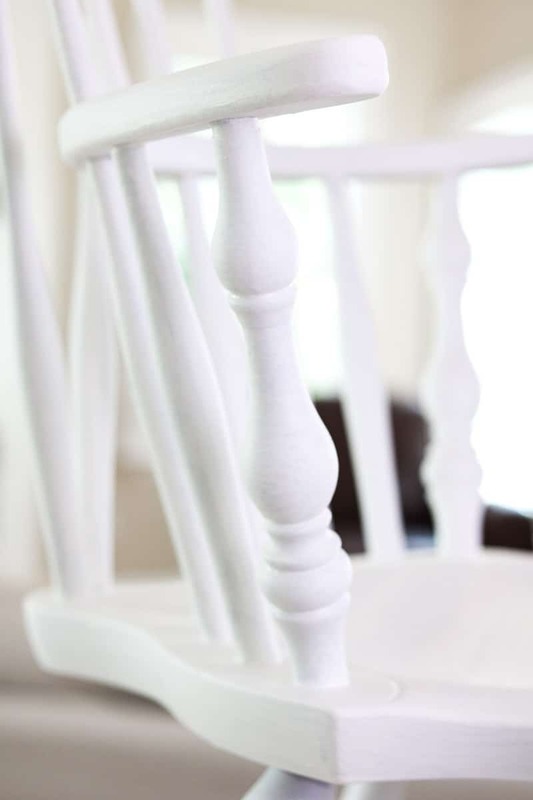 Do you know that yummy old fashion paint finish on furniture at Grandma’s house? Well, that look is achieved with milk paint. And here is a tutorial on how to paint with milk paint using what I think is one of the milk paint brands on the market. 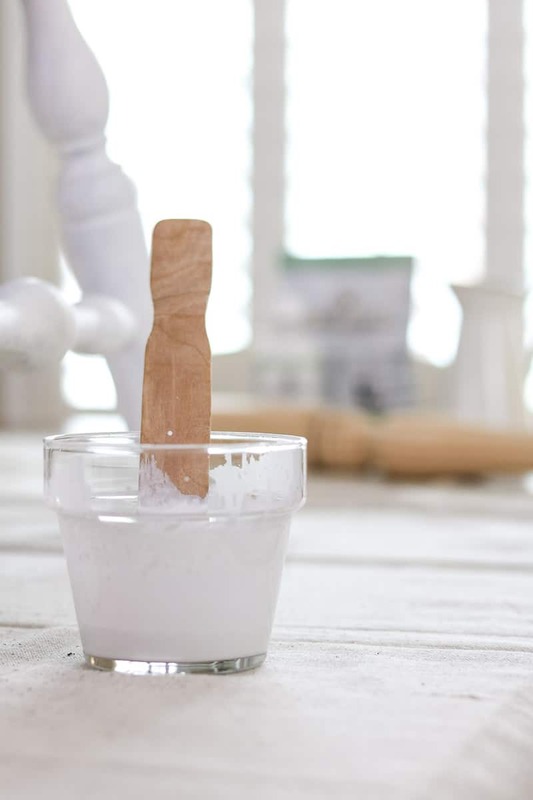 How to paint with milk paint is much easier than it looks. 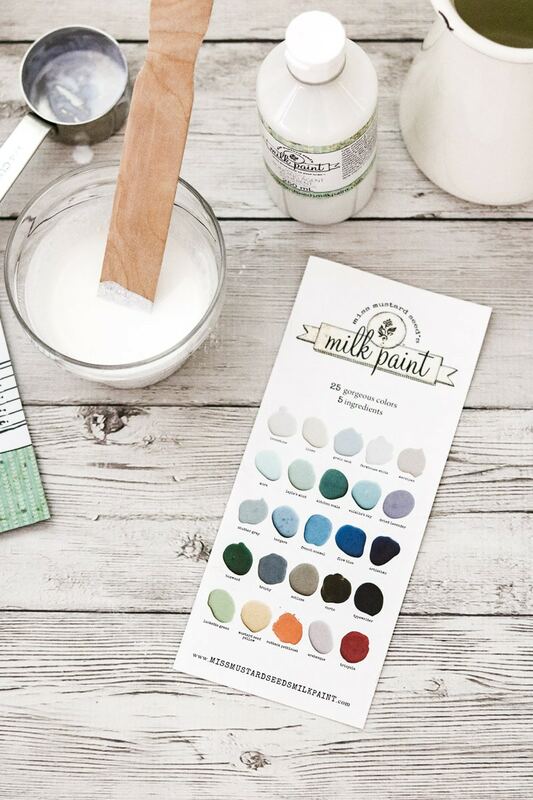 There are so many milk paint brands out in the world, but I like Miss Mustard Seed’s paint over others. Her paint has a long shelf life because it comes in a powder form. And her milk paint colors are AMAZING. 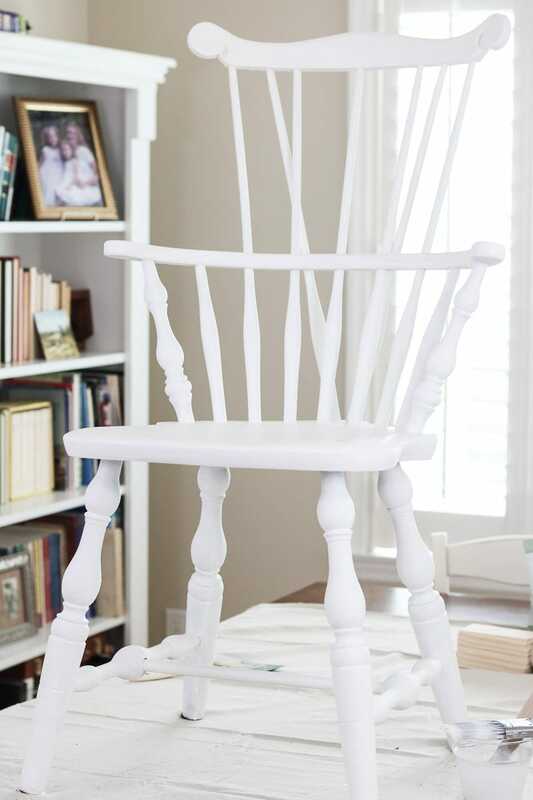 Check out this roundup we did of furniture transformed with Miss Mustard Seed milk paint colors for some great ideas. But instead of me trying to convince you about MMS paint follow along as I take you through a tutorial on how to paint with milk paint. Long before I decided to try out milk paint, I found this beat up Windsor chair on the side of the road along with its twin sister. One chair gave its life for the other by giving up some of its parts to make the other one whole. So now it is going to get a milk paint transformation and here are the steps, so you too can transform a piece of furniture with milk paint. To begin this project start with sanding your chair. I like to use sandpaper on a sponge block. A sponge block allows the sandpaper to mold around the edges. And boy, there are many edges on a Windsor chair. The most important thing is to sand any areas where the paint is coming up. Make sure to get the area smooth. I like to run my hand across it and feel to see if it is smooth after I sand it. It helps me to determine if I have it level. Now the next step is relatively easy. Just dampen a paper towel and wipe down the chair. Make sure the paper towel is barely damp. Also, if your chair is dirty go ahead and give it a washing. Then let it dry real good before the next step. 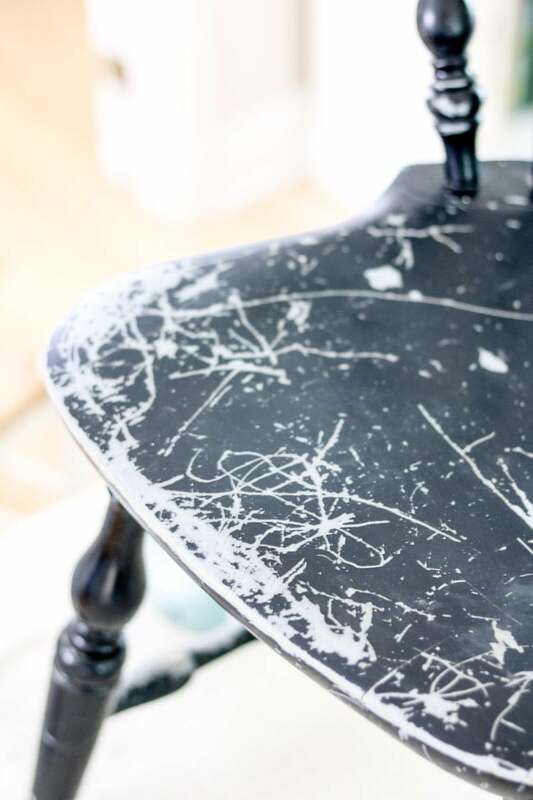 In the world of milk paint you do not always have to use primer, but in my case, this chair was peeling and shiny. 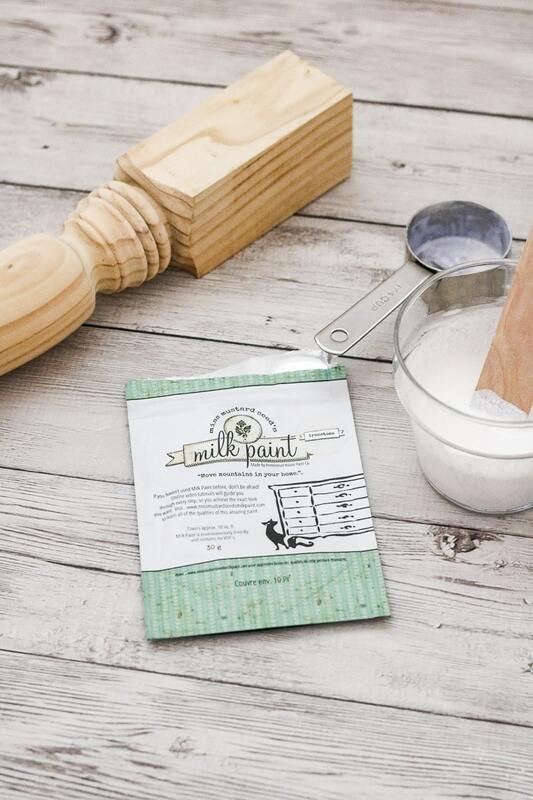 It was recommended to me by Jennifer at Eight Hundred Furniture to add in a primer step. 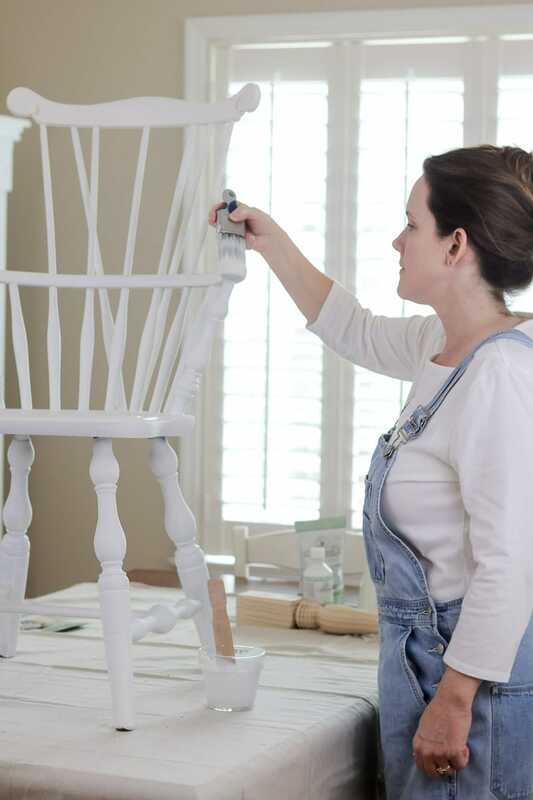 I am so glad she recommended this because not only did it help the milk paint adhere to the chair but the primer helped block the black color from running through the milk paint. 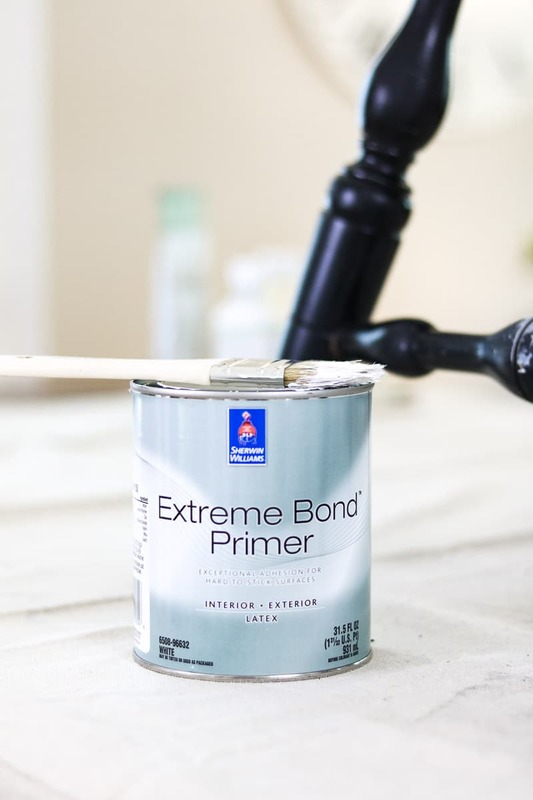 So if you need a primer to consider look at Kilz 2 or Extreme Bond Primer by Sherwin Williams, I have to say the Extreme Bond Primer worked like a charm. 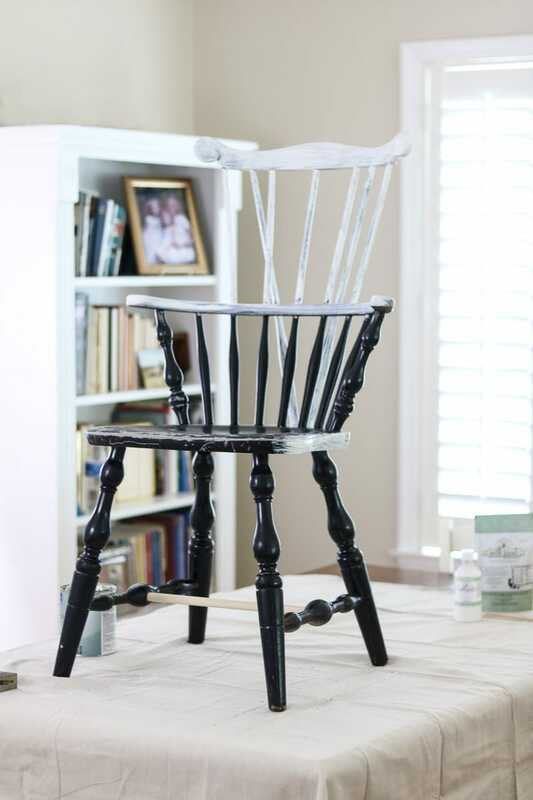 Because this chair is black and milk paint is thin, you will probably need to add two coats of primer. 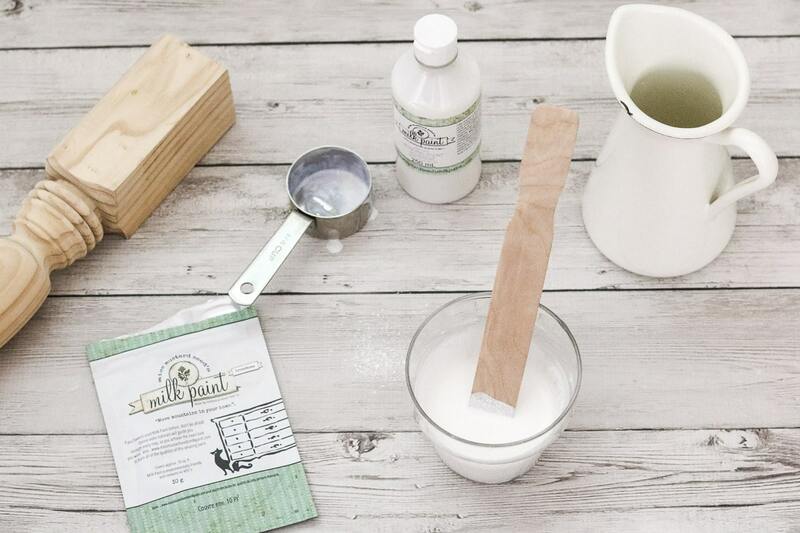 Before we dive into mixing the paint, you’re probably asking where to buy milk paint? 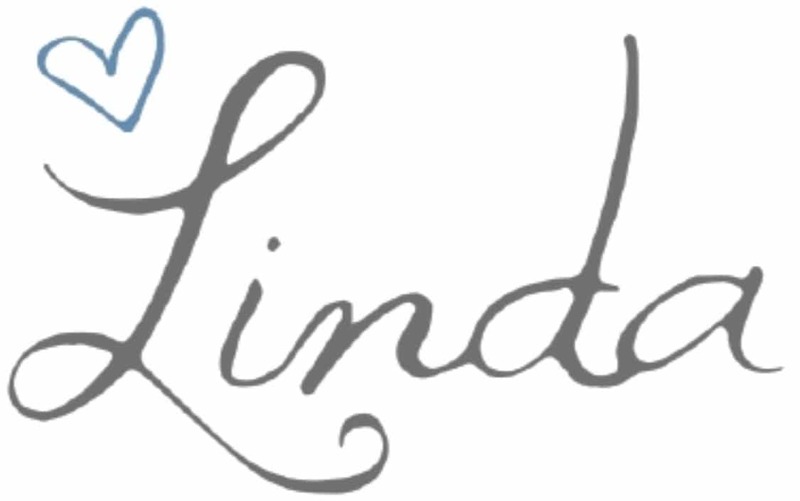 Well, you can purchase it on Amazon or go to Miss Mustard Seeds Website to find a list of retailers that might be close to you. Okay, so now on to mixing the paint. Remember me saying that milk paint has a long shelf life. Well, it comes in a powder form, so you need to mix it. But please don’t procrastinate on this step because it is super, super easy. 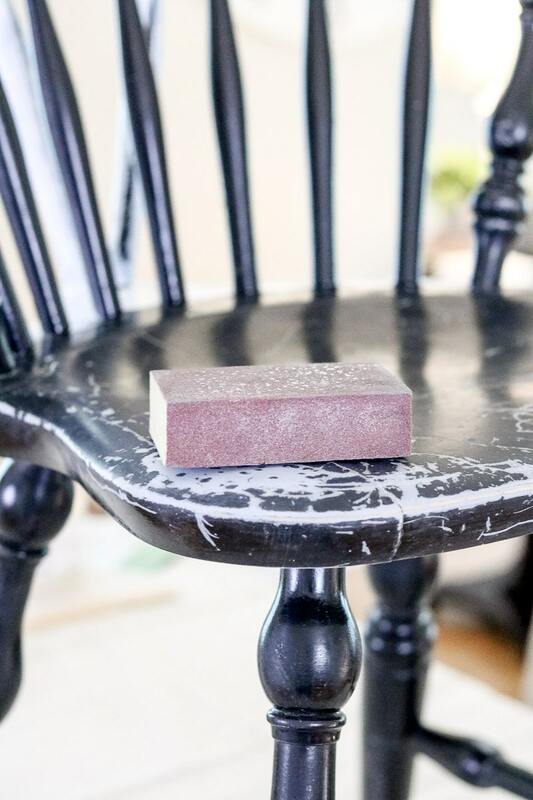 For my chair, I mixed a 1/4 cup of Ironstone milk powder, 1/4 cup of water and 1/4 cup of bonding agent. Start mixing the milk powder and water first. Give it a good stir until you feel like all the clumps have dissolved. Then add your bonding agent. It is kind of like a runny glue and mixes in very easy. 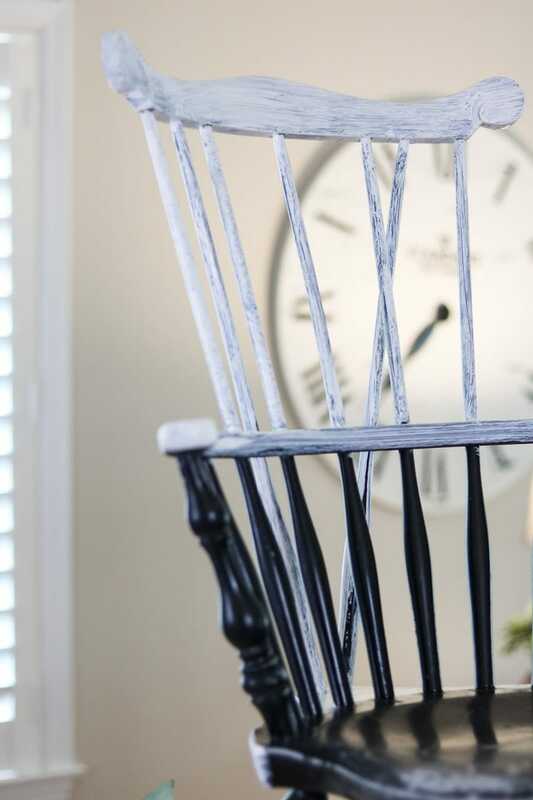 See learning how to paint with milk paint is pretty easy. Now let the paint sit for about 5 minutes. The paint sitting helps it to thicken a little, and now you are ready to paint. Painting the milk paint was a little more tricky than expected. 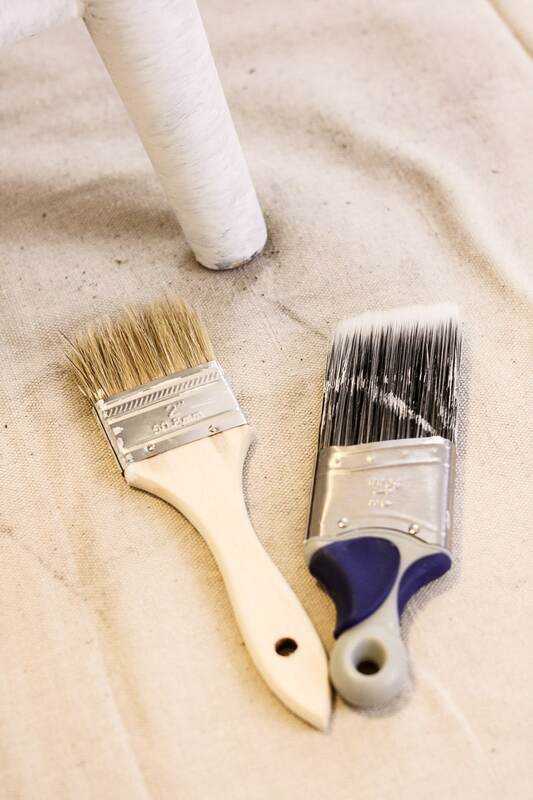 Lightly add some paint to the end of your brush and tap it on the edge of the cup to move the paint downward. Then apply it to the chair working from the top and moving your way down. Make sure to check for drips as you go. I worked on the drips with a dryer brush. Milk paint is pretty forgiving so if you miss a drip go back over it with no problem. However, if you let the drip sit too long, it will want to stay for a while. So continually give all the edges a good look for those pesky drips. Also, keep your stir stick in the cup while you are painting and stir it now and then to keep it blended. Another detail I want to share is the brush I used. For the primer, I used the cheap wood handle brush. But for the milk paint, I went with the short handle Wooster synthetic brush. I found it help onto the paint easier and moved the paint onto the chair nicely. 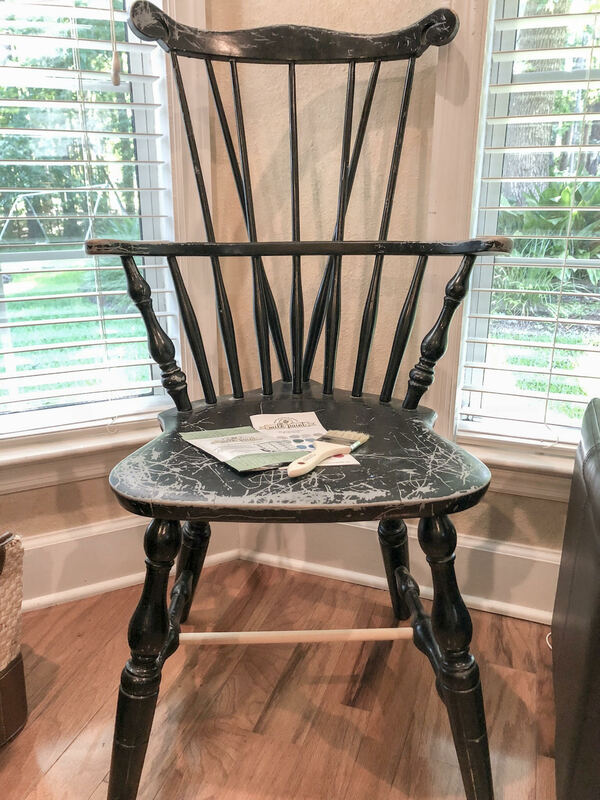 Here is an example of how one coat of the Ironstone milk paint looks. As you can see I need to add another layer. Now add another coat of milk paint after letting the first coat dry for an hour or so. It doesn’t take long for the paint to dry so you can add another layer. Here is a photo of the second coat and honestly I think it dries less and less transparent. 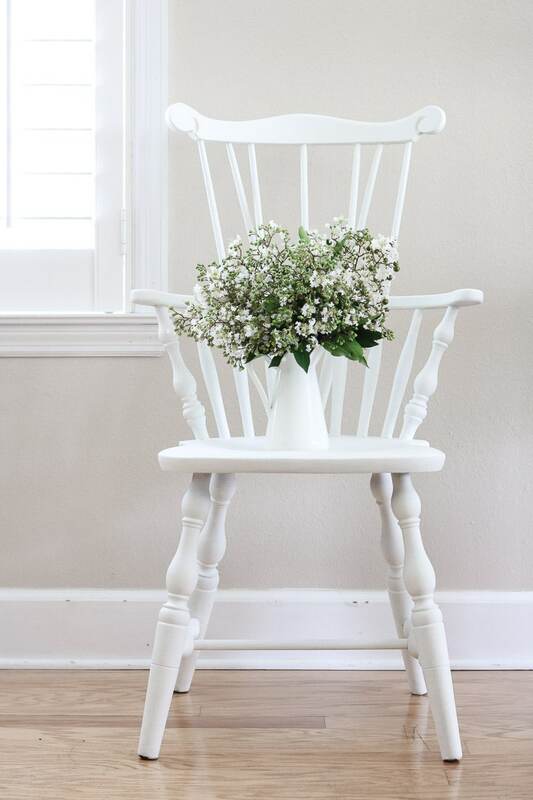 I have to say I have fallen in love with the Miss Mustard Seed milk paint. Teaching you all how to paint with milk paint was so easy thanks to Jennifer and Miss Mustard Seeds videos on YouTube. I cannot get over how beautiful this chair is now. The milk paint color we used is Ironstone. It is a beautiful creamy white! The chair is so pretty until all I wanted to do was style it instead of sitting in it. 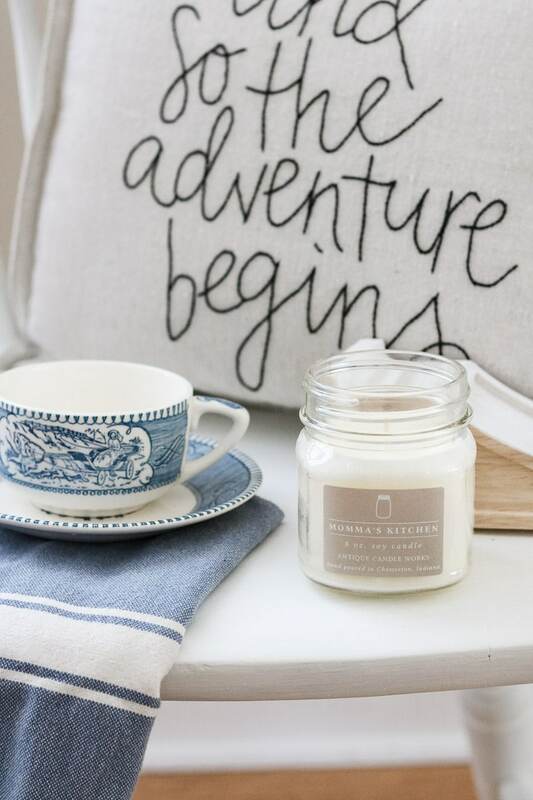 Just happens I got this candle and pillow recently so I think it has found a new home for a while until the chair will end up at my daughters’ desk. Overall I highly recommend the Miss Mustard Seed milk paint. 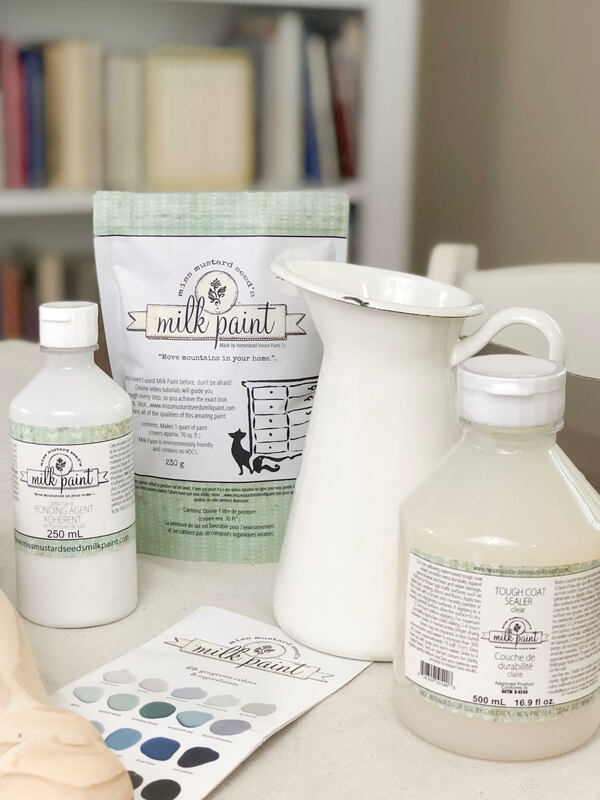 There are many beautiful milk paint colors to choose from like Eulalie’s Sky, French Enamel, Layla’s Mint and Aviary. I have not tried other milk paint brands, but MMS seems to be of good quality. I did run out of paint towards the end. I grabbed a tablespoon of powder, water and bonding agent and mixed up some more right in the jar I was using. Also, let me encourage you to put the piece of furniture on a table. It saves your back and because the chair is elevated it is easier to see the drips. And last, don’t forget a drop cloth. You will for sure need it for this project because this milk paint is drippy. Or at least my paint was drippy. Haha! 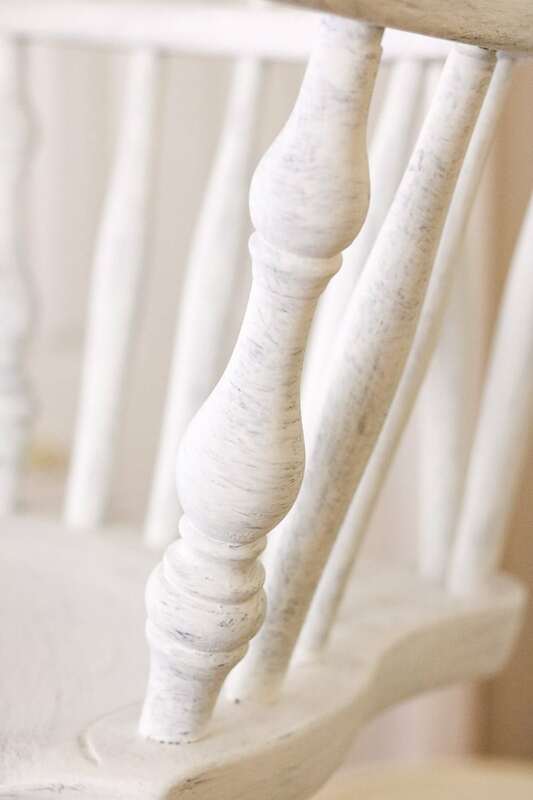 Here is a recap of the steps on how to paint with milk paint over a painted piece of furniture. 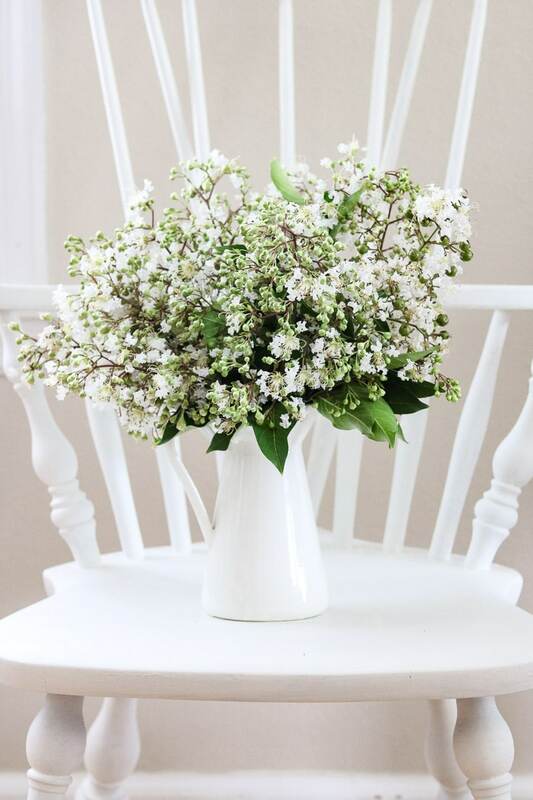 I hope you have enjoyed this DIY and I hope you try out milk paint to get that delicious vintage painted look. I love posts like this. What a lovely result. 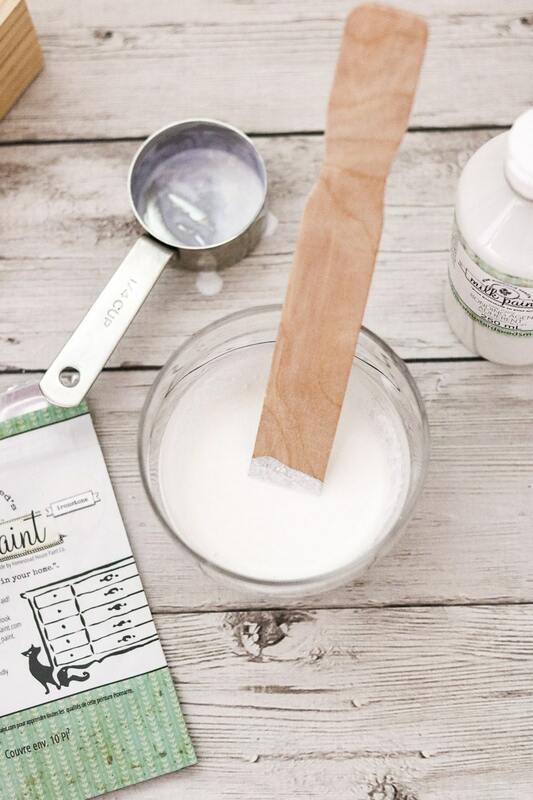 I have purchased milk paint and used it, but I bought Annie’s which did not require mixing powder. It was all ready to go. Loved all your tips.